Product code: ES1051 Categories: Sold Items, Sold Rings. Antique ruby and diamond rings are always so popular and jewellery from the Art Nouveau period of the late 19th century have such a unique and elegant design to them taking so much inspiration from nature with free flowing designs as can be seen here in this Art Nouveau ring. 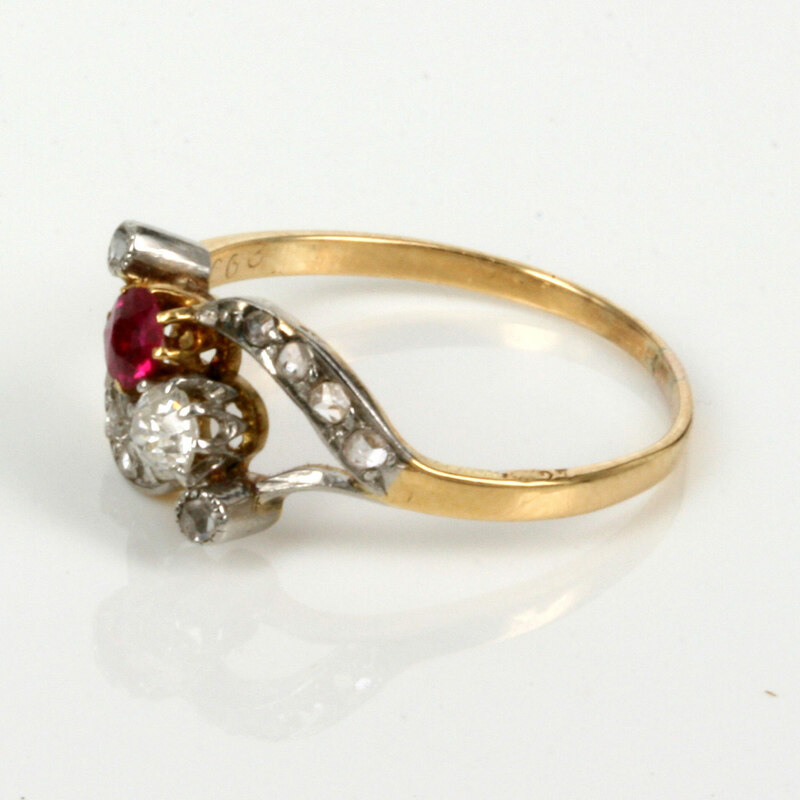 Hand made in France in 18ct gold around 1895, this ring is set with a very rich red natural ruby along side a diamond with a rose cut diamond on each end and four more rose cut diamonds running along the length of the band. The design is so naturalistic and sits so well on the finger and being such a unique design also sits so well along side other Art Nouveau jewellery or even modern jewellery. The Art Nouveau period went away from the symmetrical designs of the Victorian era and has such a unique style that is all unto itself. There is something so charming about the designs of Art Nouveau jewellery and the French jewellers of this period really created some sensational rings such as this one here. An Art Nouveau ring such as this is really perfect for any woman of any age and would sit perfectly on any finger for any occasion and the design of this ring is certainly sure to be admired and loved.